Back to the top with this post. Ruaridh is still missing. Please if you have a few minutes today have a look around near your home or street. Everywhere you go today bear in mind this black lab - a much loved family pet. Further details and link to facebook group below. "Ruaridh has been missing since 05/11/2011. He slipped his collar and bolted when fireworks went off right beside him. Hence he has no tags or chip. He's 11 years old and must be very scared right now. 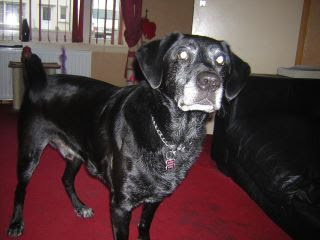 If you spot him in Nairn, Highland, PLEASE call either me on 07813022717 or Nairn Police on 01667 452222." Spread the word on Facebook here. Fingers crossed he's found soon!
" Boath Park, but was last seen heading up Viewfield. He could be anywhere"
Keep looking out for Ruaridh today Gurnites - hopefully he'll be reunited with Aileen soon.